The older I get, the more convinced I become that love is EVERYTHING. These pretty keepsake boxes are a new variation on my best selling Wisdom Boxes. They are little match boxes, emptied out and refilled with inspiration. Each is wrapped with Japanese papers. 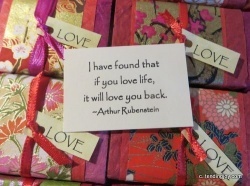 They contain 30 cards of quotations celebrating both the essence and the essentialness of love. Perfect for everyday meditations, friendship gifts and pick-me-ups, love tokens, wedding favors and more. They are approx. 1 1/2 by 2 1/4 inches small. These have a gift giver discount for bulk purchases. $12 for one, $65. for 6, and $120 for 12. Make sure you check out the drop down menu when ordering.